This recipe originated in a local church cookbook and became a favorite at our house. 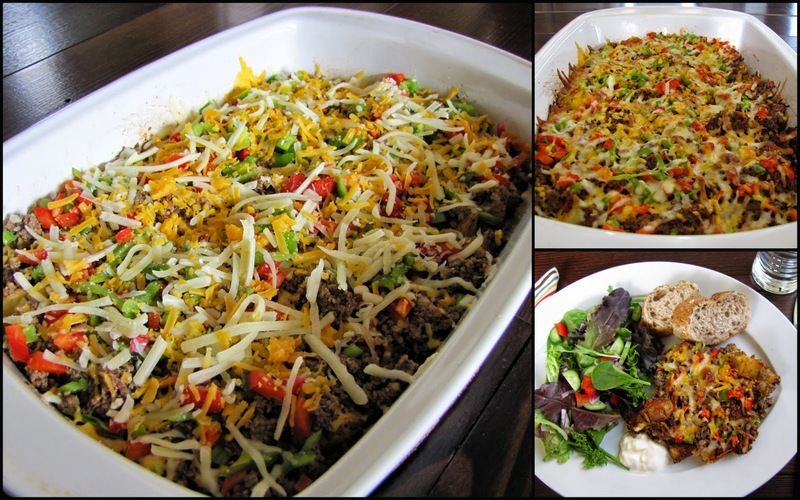 I often increase amounts and prepare in a larger casserole. Cut potatoes into bite-size pieces and place in greased casserole dish. Melt butter...stir in taco seasoning. Pour over the potatoes and stir to coat well. Bake uncovered at 425°F for 30 minutes. Stir; bake 15-20 minutes longer. Brown and crumble beef; add onion and cook until soft...then drain. Serve with additional salsa and sour cream. I haven't made this before but it sure looks delicious, Judy. So another one on my list to try.. This looks really good, it's on my list too, perhaps Saturday! looks good judy...today we had taco salad so i gues this will be on the menu next week. i hope not.that would bbe 21/2 right? Thank you, Judy for another tried and tested recipe. I love Mexican foods! Was checking to see if I could still make it for dinner tonite, but I don't have taco seasoning. I'm sure that's an important ingredient. Judy saved my day! I have been looking for just the right thing to make for a light supper on Christmas night. This will be it. I don't have taco seasoning on hand either, but it's very easy to mix yourself with seasonings you probably have on hand: ground cumin, chili powder, salt, coriander (not necessary, in my opinion), cayenne pepper, paprika (I prefer smoked paprika). Use proportions to taste - actually, I mix it according to smell: it just smells like taco seasoning when you mix that all together! This will be fresher than what you get in a packet and CHEAPER in the long run! Mmm...this looks delicious! I love mexican food, and this would suit my family just right! I think this will be tomorrows supper. Sounds great!! Mmmm I read wrong and dumped the whole envelope of taco seasoning in...still tastes good. I did the same thing! Its in the oven now and smells good, so I hope its as tasty as well! I tried the Mexican Potato Casserole recipe today, and it's a keeper! Thanks for posting it. I've made this twice now and the first time my husband said it's in his top 20 favourite recipes. Yesterday I made it again and he says it is now in the top 10! I have made this recipe probably 6-8 times now and we just love love love it. I also add a can of red kidney beans (a healthy addition!) and we serve the dish with heated corn chips & melted cheddar, sour cream, guacamole and side salad of lettuce & tomato. So very good! It is my girls' favourite! I have made this twice now and it is definately a hit! I have already told my daughter about it too, she is excited to try it. Love how easy it is to make a larger batch or add your own favorite things to. Made this tonight with a few minor alterations and it was delish. Wasn't sure I'd like potatoes in mexican flavours but darn it was great. Thanks for the recipes, they are always easy to make and tasty as heck. I really enjoyed this dish. I added fresh green onions on top and was thinking if I had fresh cilantro that also would have added that fresh mexican flavour! Making this tonight and like Joolz adding the kidney beans and serving with sour cream and avocado on top. This recipe is so delicious. I make it almost every week! I also now cook my potatos this when when I am making hash browns. I use olive oil though rather than butter. This recipe has earned a place on our regular rotation- it is so easy, and so, so delicious! Everyone who has had this loves it and begs for the recipe! We love this recipe. I have made it several times and every time I make it I hear "yummmm" from all three kids and my husband. I made it for company and each one of them went back for seconds and thirds. I make mine vegetarian by replacing the ground beef with black beans, other than that I keep everything else the same. Thanks for such a great recipe. How would this be with farmer sausage? Now that is a good question. If you try it, be sure to post your opinions here! Does this recipe work well if you make ahead and freeze?? Thanks! Melanie, I have not tried freezing it ahead. But if you do...let us know how it turns out. How many servings does this recipe make ? It sure sounds yummy. What size of casserole dish do you use? I use a 9 x 13 inch pan. Though I would say it serves 4...I often increase amounts (an extra potato or two and a pound of beef) to serve more. I wonder how this would work with rice on the bottom instead of potatoes. I've made this recipe several times and I think it would work fine with already cooked rice. I'd use at least 4 servings of rice, but you could probably go with 6 servings. Oh this sounds so yummy! This is one of my families favorite comfort foods. A bit of Mexicxano twists with potatoes. It's yummy! Wow - that sure looks and sounds yummy!! I must try making this soon. We love Mexican food and flavours. We've made this recipe numerous times since you first posted it in 2008. I generally add more veggies like bell pepper and olives. The whole family (which includes 2 elementary age boys) loves it! For a quicker dish, I am going to try using the frozen cubed potatoes & ground turkey.